Dads are awesome. They can make you laugh, grill a great meal, and fix almost anything. 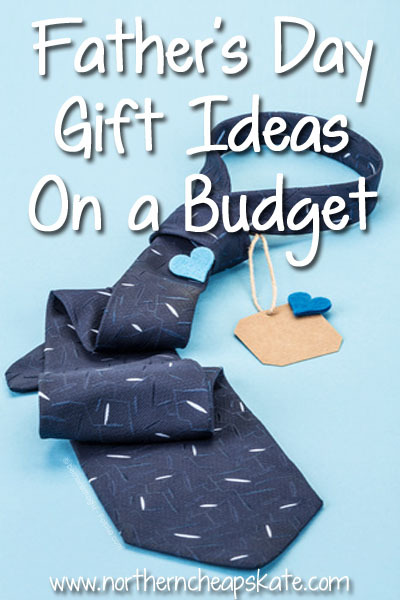 It’s only natural to want to spoil the Dad in your life on Father’s Day, and you can do that and stick to a budget. I think that’s something Dad would approve. Make a handmade greeting. Take the time to make a handmade card. Write a letter telling Dad how much he means to you. Shoot a video of yourself telling him what he means to you. If you can make it funny, even better! Get the kids to make a special gift or greeting. If you’ve got kids, have them make a gift for dad that he’ll always remember. Handprint crafts, drawings, or other crafts make memorable gifts when they’re created by little ones. Spoil him with food. They say that the way to a man’s heart is through his stomach. So use gift cards you got a deal on through Raise or got for free with Swagbucks to take him out to dinner. Bring over some steaks you bought on sale to grill. Or search the web for some decadent desserts you can make for him. Do some work. Dads work hard. Give him a break by giving him a coupon good for some free labor. Mow dad’s lawn, stain the deck, or wash and wax his car. Help him with a job he’s been wanting to get done around the house. He’ll appreciate the help and you’ll get to spend time together. Find a cool secondhand gift. Hit the thrift stores and score a really cool retro tie for your dad. Or find a useful tool or funny gag gift for much less than full price. Share some memories. Enlarge a special photo and put it in a thrift store frame. Walgreens often has a free photo enlargement offers or free photo collages just before Father’s Day. Watch for deals on photo gifts at places like Snapfish and Shutterfly, too. You can put together a photo collage using online software like PicMonkey or Canva. Create a special photo slideshow or put old family videos on a DVD. Get him some reading material. Pick up some books you know he’ll like at a thrift store. Or find a great low-cost magazine subscription on a topic he’s interested in. Spend the day with him. You may not have much money, but that doesn’t mean you can’t spend some time. Make plans to spend the day with your Dad doing whatever she wants to do – Take a walk, go fishing, or just sit on the deck and chat. The secret to giving a great gift is to give it from the heart. You don’t have to spend a ton of money in order to do that.